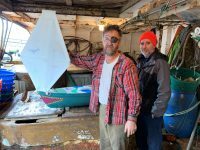 The Vermonster was given to a Rhode Island fisherman named Mark Philips to be deployed. It headed out of Port Judith, Rhode Island on December 1, 2018 and as of December 17 she appears to be sailing on her own. 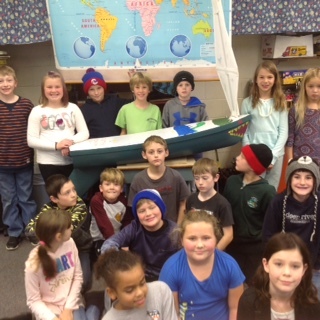 Once Mark returns to port with details we will update the page and map. 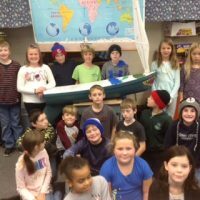 Third and fourth graders from Thetford Elementary School in Thetford,Vermont prepared their mini-boat, the “Vermonster,” in hopes that it will sail the Atlantic, tracking its many currents, to reach some far away place. In the hull they have placed writings and paintings of their hopes and dreams for their boat and descriptions of what life is like in Vermont. Also on board for the ride is a little Lego guy, named Popeye, and a small stuffy cow (Vermont’s most popular animal).